Sustainable intensification (SI) of agricultural production has become a predominant theme in development agendas in West Africa. But despite the availability of a wide range of technologies for adoption, uptake has been very minimal. One reason for the often-disappointing uptake of technologies could be poor targeting of households. Sheep owned by a smallholder farmer in Burkina Faso (photo credit: ILRI/Abdou Dangoma). Researchers at the International Livestock Research Institute (ILRI) have analysed and quantified the potential food security impact of boosting a set of sustainable intensification options in Burkina Faso to better identify which technologies would fit the characteristics of specific households. The research activities were designed to be solution-focused to meet the needs of farmers and were implemented in Seno and Yatenga provinces in the Sahelian zone of the country. The basis of the study is that there is a great potential for smallholder farmers engaged in crop-livestock systems, to produce more in a given area of land, thereby improving productivity, food security and nutrition while preserving ecosystem services. Four different interventions were evaluated in the study: increasing sorghum yield up by 50%, cowpea yield up by 50%, off-farm income increase by USD200 per year per family and goat production up by 50%. These interventions were chosen for the impact assessment because they were already being assessed through on-farm experimental trials and in participatory evaluation exercises together with farmers (increased involvement in off-farm activities). The study found that in order to improve food security for the most severely food insecure farm households, the best options were to increase sorghum productivity and to increase possibilities to generate further off-farm income. They also found that goats play an important role in most farm households, but more because they are for sale and slaughter as needs arise, rather than as an overall year-round important factor in food consumption and cash generation. Increasing their currently very low productivity by 50% would improve food security and income to a minor extent. Analyses also revealed that different interventions have different effects for different groups of households and this further highlighted the need for a clear definition of the target population. This work was part of the Feed the Future Sustainable Intensification Innovation Laboratory-funded project ‘Sustainable intensification through better integration of crop and livestock production systems for improved food security and environmental benefits in Sahelian zone of Burkina Faso’, which is led by ILRI. 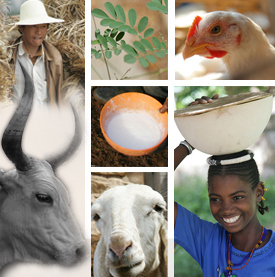 Download the ‘Assessment of the potential food security benefits of increased income from crops, livestock and off-farm employment in Burkina Faso’ report. This study was made possible by the support of the American people provided to the Feed the Future Innovation Lab for Sustainable Intensification through the United States Agency for International Development (USAID). Tags: Farming Systems, Food security, nutrition, USAID. Bookmark the permalink.